Lawrence Leadlights are a leading glass and glazing company based in Sydney. 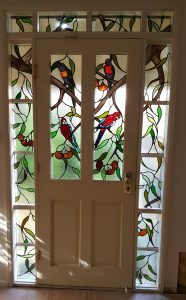 We specialise in leadlight door panels and pride ourselves in offering high quality workmanship using proven leadlight techniques. Our range of beautiful leadlight door panels are completely handcrafted and customised to suit your specific requirements. We work with you to design unique leadlight panels in contemporary and traditional designs. Apart from making new leadlights, we also specialise in leadlight repairs and restoring old leadlights. When it comes to building a new leadlight door, the right design makes all the difference. The design must be perfect for you as well as your home. We can work with your ideas/drawings if you are particular about a design. If you are looking for expert assistance, we will work with you to understand your requirements and come up with scaled drawings and present them for your review. Once we freeze on the design you like, we will build your leadlight door in no time. At Lawrence Leadlights, we pride ourselves in offering high quality craftsmanship, expert advice and a friendly service that’s next to none. All our leadlight installations meet high standards of quality and Australian glazing regulations. We can build a leadlight door panel for you in a wide range colours and textures. We specialise in unique, creative and exclusive designs. In fact, we can even fuse glass pieces to make a one of a kind masterpiece for your home. We offer an onsite consultation to understand your requirements and to determine the design and size for the leadlight door. Our fully trained and experienced craftsmen will then get on to building your custom leadlight door. Once it’s ready, we will install your new leadlight door to perfection. Leadlight panels can come in all sizes and can be custom fit to your dimensions. Our leadlight designs made of the strongest possible leadlight glass are custom tailored to your needs and requirements. We offer an all in one solution from design to manufacture to installation, ensuring that you receive the highest quality of workmanship and service for your leadlight doors.